For more than 15 years the 1st Squadron of Fighterbomberwing 32 (GEAF) has been a member of the NATO Tiger Association. 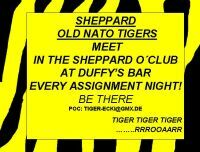 With the disbandoning of the squadron in the course of disbandoning the whole wing, the Lechfeld Tigers left the community of the NATO Tigers forever. Each of these squadrons had a tiger's head in their squadron crest. The tiger stands as a symbol of strength, speed and hunting prowess. The program of the first Tiger Meet saw combined operational flying, as well as a close formation flyby of all the participating squadrons. Following on from this success, it was decided that future Tiger Meets would be held annually.The 79th TFS continued to establish relationships with all tiger squadrons, with the result, that 8 squadrons from 6 different countries participated in the 1962 Woodbridge event. Today the NATO Tiger Association consists of 26 squadrons from 14 countries, including No 11 squadron from Switzerland, which holds a special observer status for non-NATO members. The common planning, preparation and flying of missions is the overall goal for all participants. The participants fly combined missions encompassing the entire spectrum of military operations. Alongside low flying, emphasis is placed on air to air refueling, air combat, formation flying, combat survival training, the use of weapon ranges and so on. The exchange of experiences between aircrews must not be underestimated. For countries that can not afford to participate in large Flag Exercises in North America, the NATO Tiger Meet is one of the few multinational exercises available. In view of the changing world security situation, participation is becoming ever more important. For an up-to-date and complete overview of the active and probationary members, as well as the disbanded units, and a complete list of all Tiger Meets, switch to the official homepage of the NATO Tiger Association.